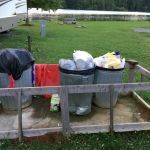 This campground is on a peninsula in the Nickajack Lake/Tennessee River and is a prime location for those who like to fish or kayak with boat ramps, fishing piers and boat trailer parking. I did not see a lot of geese or droppings. It has a lot of seasonal campers but the ones we met were all friendly. It also has a lot of tents especially along the water. It may be difficult to find an available site in the summer because of the seasonal campers. I was able to reserve a site by phone in May. The office for checking in is a little tricky to find due to lack of signage and is in the middle of the park up on a hill. I recommend that you go to their website (www.marioncountypark.com) and print a map of the campground so that you can see which roads to take. It appears that the people who manage the campground live in a yellow mobile home which is where you check in. The dump station is near the office. There are 2 bathhouses. The one by the office is new and has 2 personal rooms with 1 shower, 1 sink and 1 toilet. The other one is very old with only 1 shower, 1 sink and 1 toilet. There is no sewer at the campsites and not all of the sites have 50 amp. The sites looked level, pads are gravel, only a few have a picnic table. There are fire rings all over the park. You can see this campground from I-24 but the road noise did not bother us at all. It is easy to get to from I-24 exit 158 which has a Loves's Travel gas station and restaurants. There are beautiful views of the water and mountains. The list of rules says no alcoholic beverages. The only complaint that I have with this park is that it has low water pressure. We camped at Marion County Park and Lake in a Motorhome. I understand the previous manager past away recently and the current management is terrible. No instructions where to register. Poorly maintained. 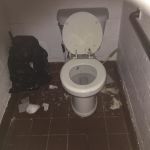 bathrooms /showers are atrocious and no supplies. Trash left in fire rings and in the water. Will no use this facility in the future. We camped at Marion County Park and Lake in a Motorhome. The price is right! The location is outstanding! The sites are mostly level. But, the bathhouse is in dire need of updating. They have brought in more porta potties to help with the bathroom issues. For the size of this great park they could use some more. Plus, there is an enormous goose problem here. I counted at least 50-60 of them. They leave behind their droppings and it makes for a mess. The electric seemed to work well. This site (33) has water but we just used out on-board water. The dump station is located a good bit from the campground. The lake (Nickajack) is very tempting. There is a boat launch just about one third of a mile from the sites. There is not a pool or picnic tables here. Cable or Wi-Fi is not available. There does seem to be a fire ring or pit in almost every site. Plus, there are an abundance of trash cans located everywhere. This did help with the cleanliness of the park. The manager was friendly and has been there a long time. I would stay here again based on the price and the location. And, this is a great place to stop overnight. However, based on the geese and other factors I must give this place a 6. 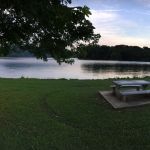 We camped at Marion County Park and Lake in a Motorhome.